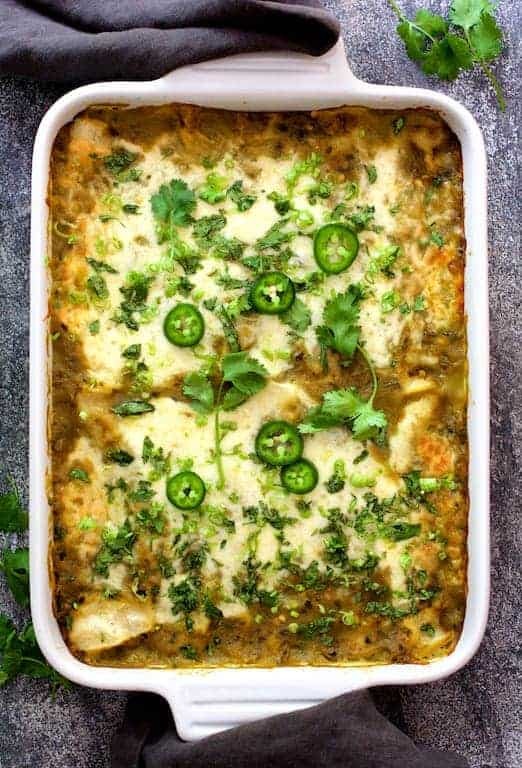 Lima Bean and Potato Enchiladas with Hatch Green Chile Sauce! Oh, yes, you did just read “lima bean” and “enchiladas” in the same sentence. Your enchilada life will never be the same! So, did you ever have that one bag of something in the back of your freezer that you hated to throw out because you knew it would eventually amount to something some day? 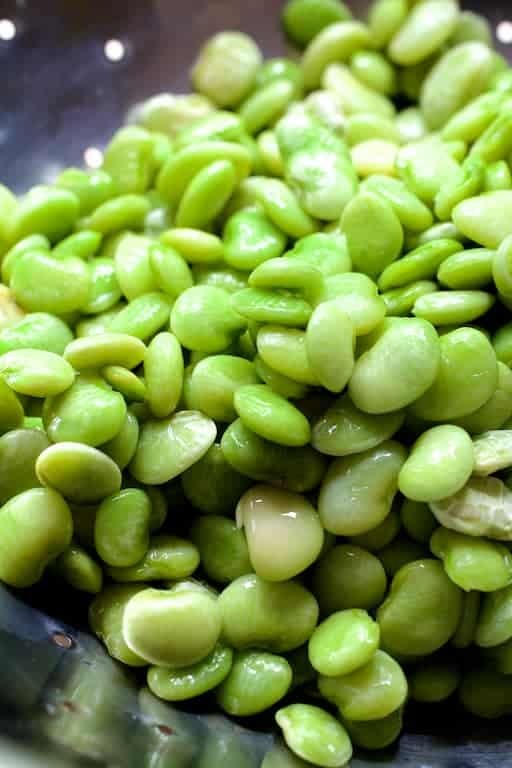 That’s the story of a bag of lima beans that has been quietly, patiently waiting in the back of one of our freezers. 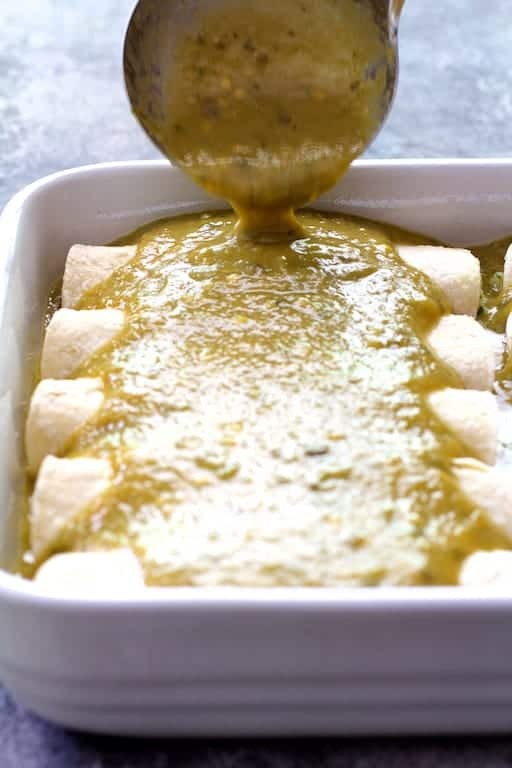 It became these delicious Lima Bean and Potato Enchiladas with Hatch Green Chile Sauce! We recently planted our garden and with it came the realization we better “get on it” and finish some things from last year. Our garden will once again be producing like crazy and one should never “file” things by year in a freezer. Although we didn’t grow lima beans last year, we did happen upon a forlorn bag from the store in the freezer along with a bounty of frozen, roasted, peeled and seeded Hatch green chiles from last year. Baby lima beans cooked up with diced Hatch green chilies sounded wonderful! However, enchiladas were calling my name! For this amazing filling, I simmered the lima beans with onion, garlic, a potato and a jalapeno then mashed the combination. I added cilantro, cheese and…. Mama! I am in love with this filling that would be great as a side dish all by itself! Puree the filling as much or as little as you like. You could coarsely mash everything with a potato masher or use an immersion blender to mix things up. 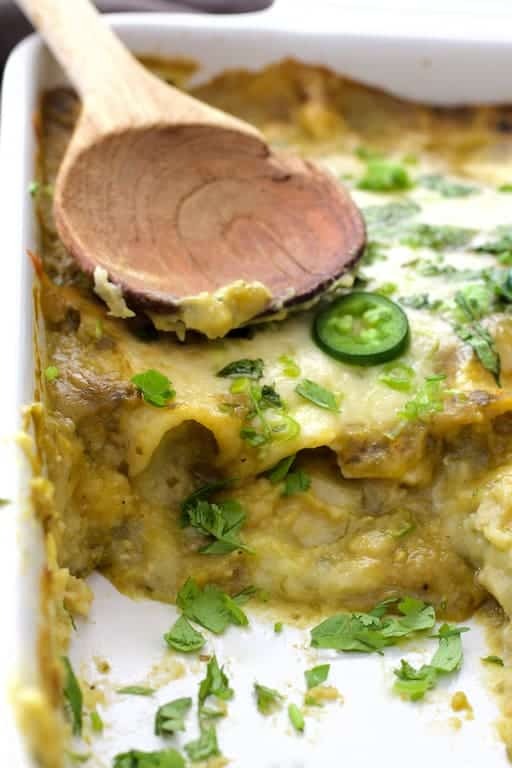 You don’t want to completely puree the filling as you won’t be left with any texture once you bake these enchiladas. Some texture in a dish like this is always good! Then the sauce, my friends. So simple and easy! Canned chiles will work fine. However, come late summer, look for fresh Hatch green chiles then roast, peel, seed your own and then freeze them as we did. You’ll be glad you did! Top with shredded Monterey jack cheese…. Bake, sprinkle with chopped cilantro and scallion and ….. Hello. 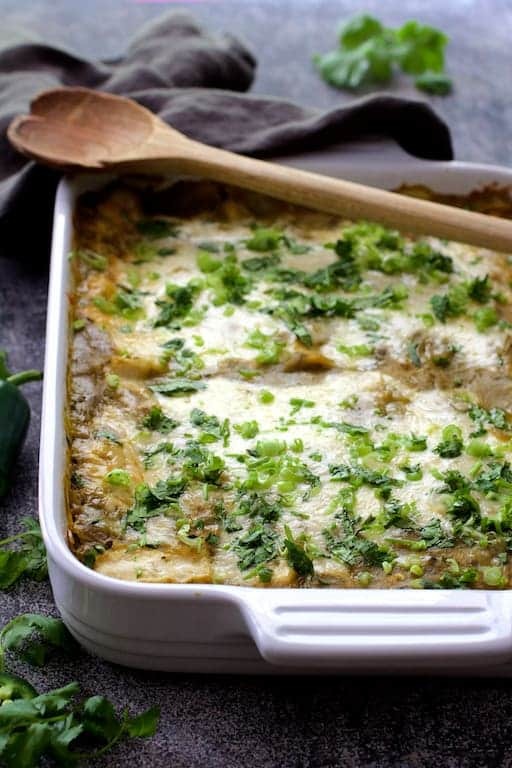 Lima Bean and Potato Enchiladas with Hatch Green Chile Sauce! Oh, yes, you did just read "lima bean" and "enchiladas" in the same sentence. Your enchilada life will never be the same! FILLING: Heat oil in a large saucepan over medium-high heat. Add the onion and cook 5-8 minutes until onion is beginning to soften. Transfer HALF the onion to another saucepan and set that one aside. In the FIRST saucepan, add the potato, lima beans, jalapeno, garlic, and vegetable or chicken broth. Bring to a boil and simmer uncovered for 12-15 minutes or until the potato is tender. Take it off the heat and let it stand for 5-10 minutes. Using a potato masher or immersion blender, coarsely puree the filling leaving bits of potato and lima bean for texture. Set aside. SAUCE: To the saucepan you set aside with half the onion: Add the oil, garlic, cumin, oregano and flour and cook over low heat for a minute or two. Slowly add the chicken broth, stirring constantly. Add the chiles and simmer for 10 minutes on medium-low heat until the sauce is thickened. Adjust seasoning with salt and black pepper. Using an immersion blender, process the sauce until smooth. TO FINISH: Preheat oven to 375 degrees. Spray a large baking dish with cooking spray. Spread approximately 1 cup of sauce over the bottom of baking dish. Working in batches, place 3-4 tortillas on a plate. Top with a damp paper towel. Place in the microwave and heat on high for 30-45 seconds. Fill each tortilla with even amounts of the filling and roll up. Place on the sauce and keep rolling until all the filling is used. Top with remaining sauce and cheese. Cover with foil and bake 45 minutes. Uncover and continue baking another 15-20 minutes or until bubbling. Garnish with chopped cilantro, jalapeno slices and scallion. Serve immediately. MAKE AHEAD: May be assembled 24 hours in advance. Refrigerate until needed. Let sit at room temperature while oven preheats. Tried so many times to save lima bean enchilada recipe. Can you send me the link? Thanks! Hi, Sherry, So sorry you’re having problems but I’m not sure exactly what the problem is. How were you trying to save it? Can you be more specific? If you want to print it, there is a print feature at the top of the recipe. If you scroll down past the recipe, you’ll see a bar where you can save to Pinterest, Yummly, share on Facebook, Twitter, etc. Thanks and hope you enjoy! I never would have thought to put lima beans in enchiladas but it looks delicious! Thanks, Christine! They work great because they’re so mild-tasting. You had me at “hatch green chiles” and piqued my interest with “lima beans”. This recipe looks so good! 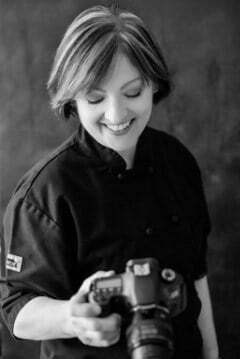 Thanks so much, Eleonora! We really enjoyed them! Yum! Perfect timing since Cinco de Mayo is around the corner. 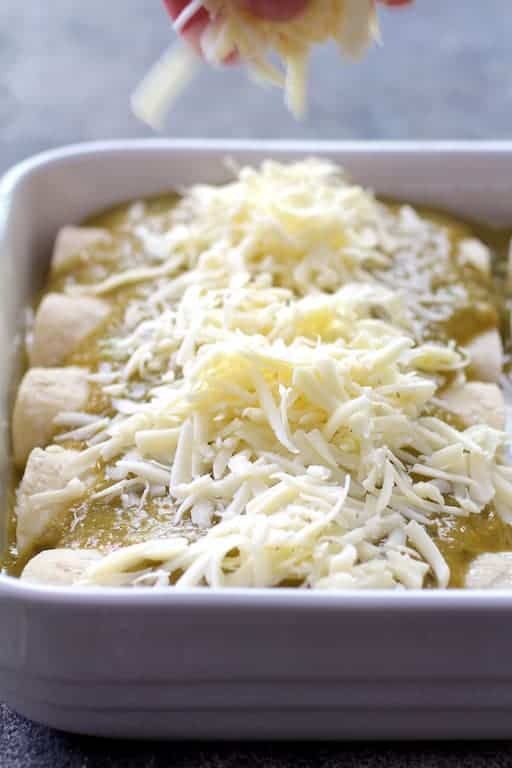 These enchiladas look so delicious, especially with that delectable looking sauce!